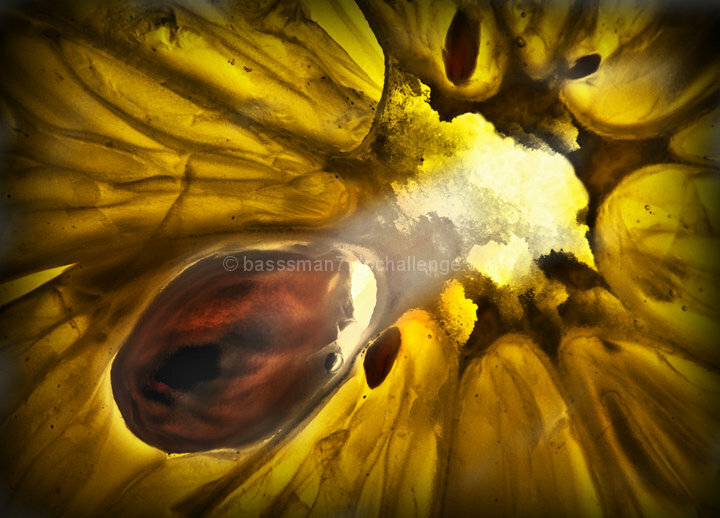 This is a macro shot of a slice of lemon. The lemon was actually leaning on the end of a snoot attached to a white lightning studio flash unit. I used the +1 and +2 macro extension tubes and obviously focused manually. Post was mostly shadow/highlight to bring out the contrast a bit more, curves, hue/sat just a tad, then a bit of cloning to clean things up just a bit. rotate a bit. crop. Unsharp mask. noise ninja. add vignette. dodge tool various places. save for web. This really stood out to me during the challenge; I really thought this was going to be a ribbon contender. I gave it an 8. This is an amazing photo. I have just added it as my first favorite! This was one of my favorite shots in the challenge--the lighting and detail are fantastic. Completely underrated, I think. I never would have guessed. I really love this image. Even knowing what this was, I had to squint to see it. Fabulous shot. A fave! A shark's egg? It definitely looks embryonic. It is a great image. lemon or orange slice with seed? A stumper, so meets the challenge. But too abstract for my taste. I can't find anything to hang onto here. Pretty cool image. It looks like some form of citrus fruit. Interesting to look at, looks like some kind of flower/seed? I'll be seeing this one in the top ten. Perfect title for this! Looks like you used lighting to great effect. Great shot--has a very "sci-fi" feel to it. Orange or lemon slice. Nice. great shot - very mysterious though... maybe a pice of citrus fruit? Lemon? Is this a lemon or orange backlit? How marvelous! Like a painting by Rafael. Proudly hosted by Sargasso Networks. Current Server Time: 04/23/2019 04:10:01 AM EDT.